When is a cat carrier not a cat carrier? No, that’s not a Zen koan. It’s a real question, and the answer comes in the form of a story. You see, it all began when my sibling, Ellie, needed a trip to the vet. 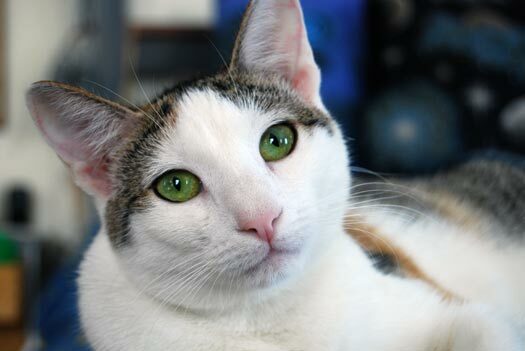 As you may know, Ellie was a bit wild when she came to us three years ago, and she’s still not very approachable. She won’t tolerate being picked up like a normal house cat. In fact she will only come to you if you are lying down or sitting on the floor. And then she comes only briefly and only for petting. Any move to pick her up and she’s gone in a flash. So anytime a vet visit is called for, it becomes quite a production for Burnell, our resident cat wrangler. First the cat carrier is brought up to the bedroom a few days before the appointment so Ellie can get used to it being in the room. Then the morning of the appointment, the carrier is left upended at the end of the bed with the door open. Next, Burnell sits on the floor near the carrier and begins playing with us using what he and Betsy call a “cat toy,” which is usually something noisy and small tied to a string. We all play along and pretend to be amused. Eventually, if things go as planned, Ellie will decide she doesn’t want to be left out of the game and she’ll come close enough for Burnell to grab her by the scruff of her neck and lift her up, at which time she goes completely limp. It’s really quite remarkable, actually. I hear it goes back to when we were newborns and our mothers carried us that way. Anyway, Burnell will then struggle to get to his feet all the while holding Ellie in this position (he also supports her weight with the other hand up where her front legs meet her body). Now it’s into the carrier. Since it’s upended with the door open, he simply has to lower her into the carrier, release her and then quickly close the door before she can jump out. Of course, that’s if everything goes as planned. Needless to say, it didn’t. Ellie is fast and furious and on the day in question, she was obviously more than a little suspicious. 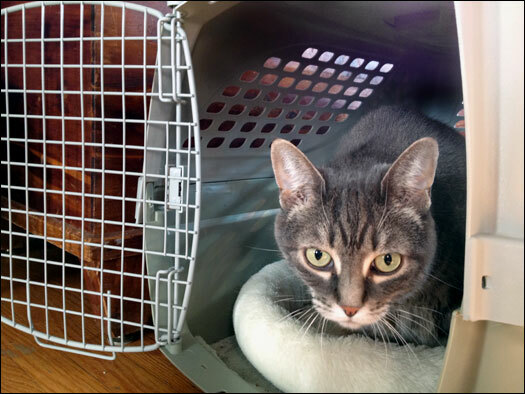 After trying for two hours to coax her close enough to effect a grab and lift maneuver, Burnell gave up and called the vet to reschedule the appointment for another day. Now back to my original question: When is a cat carrier not a cat carrier? 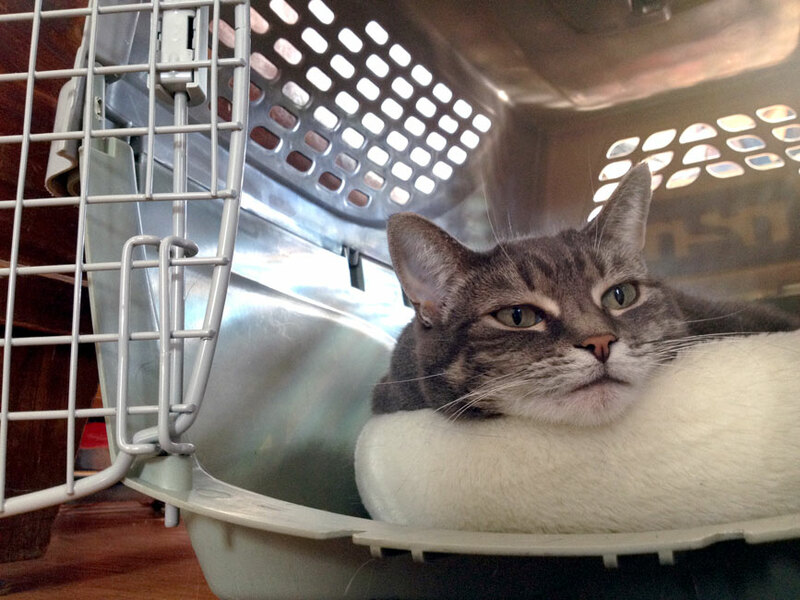 It ‘s when a cat, not unlike myself – actually it was me – decides to take up residence in said carrier and even goes so far as to schedule an appointment with an interior decorator. I’m thinking a nice Sahara Sand for the walls. What do you think? I think,Nora,…you have to ask Mindaugas.I am sure that he knows a solution for this problem.He has also helped our Midas and when you ask for it,..then he can show you a video with Midas. I heard he will come soon at your place. :-)) And Burnell,Betsy and he must have a serious talk about this major problem! A firm pat from Wilma from Holland. You need a piano in there too! Nora, you already have a white “floor”…how ’bout black walls? A piano keys decor? You could even have Betsy stencil music notes on the walls!